Many of you will be aware of the sad loss experienced by our DorSAR Colleague Howard (Greg) Gregory, after many years of struggle Carl (Greg's Son) past away. At the time Greg was torn between the release this gave Carl and the torture of him being taken. Although we never met Carl in DorSAR it is clear from the information we have that he was a selfless person who would do all possible to help anyone despite his own struggle. 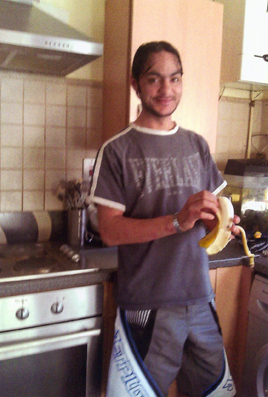 Greg has told us that Carl longed to Join DorSAR but sadly his condition was always going to make this impossible. Although it was a big surprise and honour to be informed by Greg that he would very much like the collection from Carl's Funeral to be donated to DorSAR in the form of a piece of equipment that would continue to serve the Misper in Carl's memory, it seemed fitting to accept and honour Carl in this way. As Greg is our lead First Aid Trainer and his other son is a paramedic it was only right that the equipment be a piece of First Aid equipment. Greg and the First Aid Competence Group decided on a "Faretec CT-6 Traction Splint", a seemingly small insignificant piece of equipment when in it's bag, but for those of us who have practiced with it, it is clear that it is easy to both use and carry whilst providing for excellent leg immobilisation. As well as the Splint the monies collected in Carl's memory also provided an "ADC Temple Touch Thermometer" and a "Diagnostix 700 Sphyg" all very welcome additions to the first aid equipment that we have available. Greg said just after the presentation "it was fitting that just as in life Carl had continued to help others after his departure, he would have loved to have been a part of DorSAR and in some way he now is". Chairman Colin Poulter said "DorSAR was truly grateful to Greg and his family for the donation, I am sure that the members of DorSAR will use the equipment to good effect and continue to do further good in Carl's name". 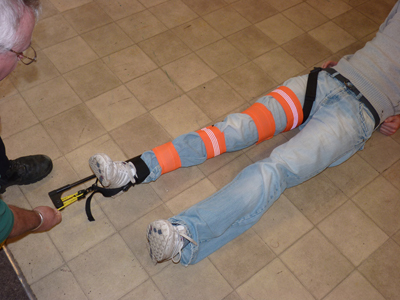 First Aid Competence Group Leader (CGL) Barry Taylor said "The Snr medics have already referred to the Traction Splint as the 'Carl Splint' which is somewhat of an easier name than the 'Faretec CT-6 Traction Splint', it's a great piece of kit and it's amazing how effective it is. Pictured above, right is Carl, to the left we have Greg handing over the Traction Splint to DorSAR Chairman Colin Poulter and below Greg is pictured with Mike Leonard who was the first Guinea Pig for the DorSAR Snr Medics to practice using the Traction Splint.